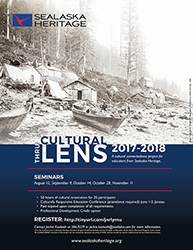 Sealaska Heritage Institute (SHI) is recruiting teachers and educators in Juneau for its 2017 cultural orientation program. The program will offer 50 hours of cultural orientation for 20 participants through five seminars in August, September, October and November. Attendees also will be required to participate in SHI’s Culturally Responsive Education Conference from June 1-3. Educators may register at http://tinyurl.com/jnrlymu. For more information, contact Education Director Jackie Kookesh at 586-9229 or jackie.kookesh@sealaska.com. This program is funded by Sealaska Heritage Institute and the U.S. Dept. of Education Alaska Native Education Program.